In order to start a game all you need to do is select an empty slot (or go over an old one), enter your three letter name and you can get going right away. As you begin you should note that you start with two lives, two hearts (there's no Sparx in this game for some reason), the basic charge attack and an objective of freeing a single Elder. Moving right you'll be informed of how to break jars, pressing 5. There's nothing actually inside the jars though so continue on. Jump up the platform and as you advance towards the first actual gem the game will let you know about how to increase your kata, which is by collecting 25 gems of the corresponding colour. In Charge's case that colour is green. Drop down onto the two gems there and jump up to the right to continue on to a yellow chest which you're not strong enough to open yet. Drop down a large drop and continue on going right until you reach the first teleporter. The game will tell you to press 5 to warp to the other dimension, do this whilst standing on the teleporter. There's nothing else left in this Material dimension so just use the teleporter now. You are now in the Shadow dimension. You may have noticed, but teleporters aren't in the same place in both the Shadow and Material dimensions so you can't just switch in and out straight away. If you now head right again (go back left as far as you can go to get a couple of gems first though) you'll pick up a yellow crescent. This is the CHI kata which allows you to fight in the Shadow dimension. Jumping up to the right will again give you a similar message to before about collecting gems to increase your kata, this time it's yellow for Chi. Your first enemy is up ahead, jump up and fire the Chi attack at it as it approaches you. If you jump up to the left and up left again you will find a couple more gems, but head back to where you killed the enemy again and just past it you'll find the first Dragon of the game that you need to free, he seems to be crystalised in some kind of purple stuff. Just walk into him to free him. The game will then tell you to find the level's exit, marked by a floating arrow just to your right. The game will then inform you that you've opened up another level. Let's do that. Down to the right you'll come across a locked door, you'll need a key to get through it which you don't have just yet so instead jump up to the right from the start charge the jar, grab the key and ignore the blue chest. Jump back down to the door and just walk through it, the key will take care of it all for you. Pick up the blue crescent to get yourself a new kata, TAIL, which allows you to fight in the Material dimension now. Being blue, you'll be collecting blue gems to improve this one. Jump over a small gap to a couple of jars, then jump down that very same small gap. Going on right you'll need to go into the Shadow dimension now to continue on. If you head back left a little you'll be able to get another gem and attack another Shadow enemy but that's it so go right and jump up the jagged mini platform to a higher platform, with the level's first Dragon to free as well. Jump down and down again to a teleporter, don't use it just yet though. Jump up a couple of branches to the second of the level's Dragons, then go left and kill another Shadow enemy, then jump up left and then up to the right where you'll find a new heart if you need it and a gem. Next you'll be wanting to drop down to the branches again and back down to the teleporter, transfer back to the material dimension and go along to the left a short way to take care of the material dimension's first enemy, a crab. As it gets close use the blue Tail kata to kill it before turning back and going up the branches again, this time in the material dimension. Go left at the top, grab the gems here, kill the next crab at the top and once that area is clear again go back to the branches and head right. As you reach the end of this platform, jump up the to right to some more gems, then down to the right to a dead end, then head left over a yellow chest, which you still can't open, jump left and down again, then further left and down several branches to a teleporter. Head back up the branches and up to the right again to that dead end where you'll find the third Dragon to free. Drop down to the left past the teleporter you passed on the way to the third dragon, kill the enemy down there and free the final Dragon of the level. Another level well done. Jump up to the right, up again and then up to the left to some gems, then back down and carrying on right. Drop down onto a key and down again onto a teleporter, transfer to the Shadow dimension. Jump up left twice to the level's first Dragon. Use the bridge that's only in this Shadow dimension to cross over and kill that creature with your chi attack. Use the teleporter beyond it to get back to the Material dimension. Thanks to that key you found you can get through the door, then just drop down the hole. Smash the two vases and kill the crab to move on further right again. Use the next teleporter as per usual. You may wish to back track a little in the Shadow dimension to grab a few gems, but then use the branches up to the left of where the teleporter was to move on. Jump up onto a few of those icy blue platforms to get up high to the right, then drop down and quickly kill the enemy with a nice chi attack. Just beyond the next teleporter is the second Dragon. Go into the Material realm to continue. Your first sighting of a wasp is now, these take two hits with the level 1 tail attack, with stronger attacks you can hit them with less to get the same effect. Drop down the gap it was guarding and as you fall move to the right in order to land on a secret platform. If you have managed to gather enough green gems to upgrade your charge to level two, then smash the yellow chest here and continue down the gap again, at the bottom is another yellow chest to open if you can. If you go past the teleporter down here you'll find a locked door, so use that teleporter to go Shadow. There's one of those creatures again to the left which you should kill before going in completely the opposite direction. On the ledge opposite where the door was is the third Dragon. Move on right, time a jump so that the shadow enemy isn't going to get in your way as you land, then kill it. Use the blue ice platforms above you to get up to the top of the level. Grab a heart on the right if you need it, then go left and kill another shadow creature with your chi. And just past another teleporter is the second to last Dragon. Transferring to the Material realm will allow you to smash another of those yellow chests and be blocked by a large locked door. Luckily the chest has a key inside, so use it on the door. Another yellow chest waits beyond. Drop down the hole just before where the door was and fly to the left as you do so, land on a branch with yet another yellow chest. Drop down to the right, then down as far as you can go until you get to an arrow marking the end of the level, don't go through it however as you still have one more Dragon left to free. Continue on down to the left now, kill the crabs and wasps as you go, until you get another key. Pick it up and go back to the exit again. Jump up to the left, up again, then down and over a gap to the locked door. Open it. Well you might as well do everything. Drop down the hole you just jumped over and continue along till you get to a transporter, use it. Up two to the right, then one to the left and another up to the right and you're at the final Dragon to free in this level. Free it and drop down to the level's exit below. Straight away you'll see a wasp to kill, then a dead end with a teleporter. In the Shadow dimension however, there's some ice platforms going up and outta here. Jump up 'em and then to the right, then jump off grabbing the stream of gems as you fall, and as you land you will probably land right on top of the first Dragon. Then drop down to the left. Grab some gems on the left here, but watch out for the creature that pops out of the ground at regular intervals, you can't kill it but it can certainly kill you. Going right, you'll meet another brand new creature, I'm not entirely sure what it is, but it takes two level 2 chi attacks to kill it. Use the teleporter it was guarding. Jump over the gap and grab a few gems before jumping down that gap. A door to the right, spikes to the left, you're going to need to jump over the spikes. Then down and along, down and over some more spikes and to a key. Jump back to the door and go through. Drop down and go to the Shadow dimension. Just up to the left is the second Dragon, and a couple of shadow enemies beyond it. Jump up to the right of the teleporter and use some of those ice platforms again. Go right to the top and kill the enemy and grab a few gems before going a short way back down and to the right where there's another of those floating Shadow enemies, kill it and rescue that third Dragon. Back in the Material dimension, jump down that newly formed hole and kill the wasp flying about down there. Jump over the spikes and down the hole to a yellow chest which has a new heart upgrade for you. Drop down the hole on your left to fill that heart, then kill the wasp. Just past him is another yellow chest, nothing special this time. Drop down the hole to the left now, and transport back once again to the Shadow dimension. Watch out for a poppy-up one just to your right and then jump up the ice platforms and move on right, kill the creature there first though. Go right and up another magical set of ice platforms, over an obvious gap-later-on and go on right till you get to a transporter, don't use it just now though. Use some platforms on the left to get up quite high and grab a key and the fourth Dragon, watch out for the popper just in front of it though. Go back to the teleporter and go to the Material dimension again. Go left and through a door before dropping down the hole just after it. Jump over the double spikes to a teleporter, kill the wasp (jump over the spikes to avoid accidently transporting into the Shadow dimension, also smash the vase here) then teleport to the Shadow dimension again. Kill the shadow creature here, over another double set of spikes and a single, to free the last of the level's Dragons. Go back over all those spikes again and back up the ice platforms, now go right all the way to the level's exit. Four levels down. Another wasp right off, jump over some spikes and teleport into the Shadow dimension. Jump up to the left and free the first Dragon here, then up the three ice platforms to kill one of those small shadow creature things. Go on past the teleporter and over a bridge of ice platforms. Avoid the pop-up creature and go up a small set of ice platforms, kill a couple of creatures along the way, then over another few ice platforms to a teleporter and a key. Teleport to the Material dimension and grab some more gems to the left then jump down, go back to the Shadow dimension and free a second Dragon. Jump off to the left, following a trail of blue gems, kill the floaty creature and pick up another key. Drop down to the right to get the third Dragon, then down again to quite near the start of the level. Move on right all the way to the teleporter next to an ice bridge, use it this time. Watch out for the wasp, then drop down, kill another wasp and go through a locked door or two. Continue on right, then up past the teleporter, kill yet another wasp then use that teleporter. Jump up to the right and kill a floaty guy, the head back to the left, avoid the pop-up, jump down and kill a floaty guy and grab the key. Head back a little and jump up a series of ice platforms to get to the fourth of the Dragons. Use the teleporter right near you and jump back down the gap again, going right you should now jump down the hole to the right of the teleporter. Teleport to the Shadow dimension once again as you reach the ground, up to the right past another teleporter is the fifth Dragon. Jump up a load of ice platforms right up past a small place with a couple of gems on (grab them as you go past) and to the final Dragon and the exit right by it. Going up the ice platforms further will allow you to kill another floaty guy, teleport back to the Material dimension and grab a line of yellow gems floating in the air off to the left. Then go all the way back to the exit and complete the level. Head right and drop down the hole, grab a few gems and smash a few vases before dropping off to the right again. Kill the wasp and go on right, jump over a hole, up a couple of platforms to a teleporter. Use it then jump on the platform to your left, jump up again then to the right onto some ice platforms. At the top is a floaty guy and the first of the Dragons. Go back down those ice platforms again and drop down a gap with some yellow gems in, fly left as you fall to avoid a spike trap, then carry on going left, kill a couple of enemies and free the second Dragon. Work your way back up to grab those blue gems down a hole, then use the teleporter and go down a hole to its right. To the left is a locked door (which you may already have a key for, from the previous level), and to the right is a blue chest, if you've gotten enough green gems to upgrade to level 3 by now you can smash it open, and just beyond that is a yellow one with a life in. Jump up to the left though to grab a key in the air which you can use on the locked door. Kill the wasp, grab a few gems beyond the teleporter then go into the Shadow dimension. Up to the left is the third Dragon, and just to your right you may want to watch out. Continue on right to where those chests were, now use the ice platforms to go above there. Jump over some spikes onto an ice bridge, then jump up at the end, avoid the pop-up right at the edge and use the teleporter. Just to your right now is a wasp, kill it and then drop down to the left. Continue left once you reach the bottom, jump over another of those pop-up monsters and free the fourth Dragon. Then go right, up a set of ice platforms and free the fifth Dragon. Use the teleporter just beyond it and then drop down the new hole on the left. Go to the left, open up the blue chest to get a key out and use it on the locked door on the right. Use the teleporter on the other side, drop down to the left, kill the floaty guy, further left and down again, kill another and avoid the pop-up monster before freeing the sixth Dragon. Back to the ice platforms above where you teleported in, use them all the way up, go right when you get to the top, away from the exit. The final Dragon is one jump away, kill the enemy and free that last Dragon. A seemingly ordinary level at first but there are no Dragons to free. Jump over the gap on the right and wander along past a heart piece to get a couple of blue gems. Go back and drop down the hole. Turning to the right you'll finally meet the Sorceror. Hit him with the tail attack four times and he'll vanish into the Shadow Realm, follow him through. Go to the right again and start hitting him with your Chi Attack, four times again. He'll go back to the Material Realm again, follow him through. He'll now start firing balls of fire at you, just jump over them and attack him with the Tail Attack again, four times and he goes back to the Shadow Realm, again. Jump over the flames on the ground that he fires and finally defeat him by attacking him with the Chi Attack four times. Game over, well done. 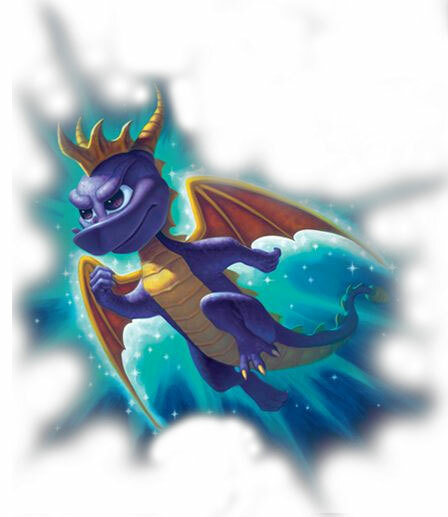 Congratulations Spyro, you have saved the Dragons' country! Nothing left to do now but collect any gems or chests you missed. I couldn't get the seventh level (ie the boss level) to show up. What r u guyz talkin bout?! I unfortunately had to use another version of the game to do so as that level doesn't seem to work on my actual mobile. So you got to that level!